There’s place for creativity and imagination in every small thing that surrounds us. Taking my morning shower in a standard bathroom with a standard bathtub I was dreaming of something special, something that would inspire me no matter where in my apartment I am. Creative designers know that people want special things and take their best to work in this direction. Even such a seemingly standard thing as the bathtub can become a true piece of art and not only cause the “wow” exclamations but give magic feeling of comfort and relaxation that we so deeply miss and lack in this mad business world. In this post you will find a collection of charming designer bathtubs created over the last few years. Made from different materials, in different shapes, colors and full of different devices, all these bathtubs are meant to make you feel special and they perfectly cope with this task. 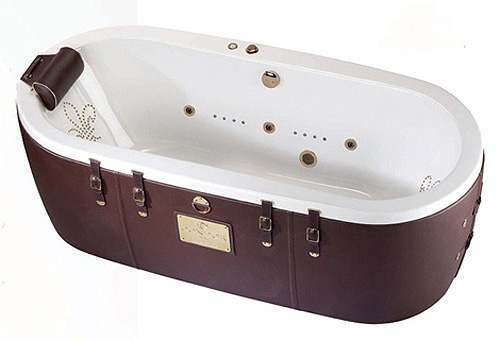 This beautiful bathtub has a 115 mm rim that can be used as a comfortable seat. The soft LED light shimmers below the rim creating a special atmosphere of comfort. Your worries vanish with the white light and after a hard day in the office you can finally relax. 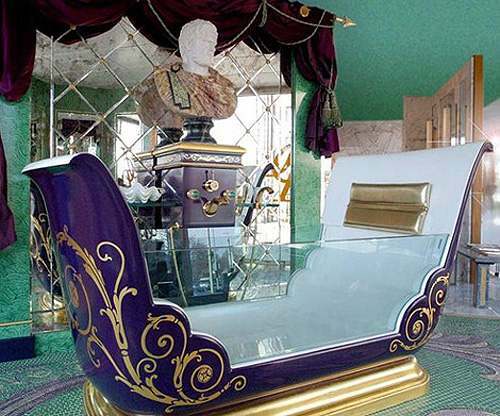 This bathtub is notable for its unusual shape. Designed by Bainultra professionals it has a ThermoMasseur® unit that can really offer you a privileged moment. With warm water surrounding you and air massaging your body you are likely to be on heaven. The new Nahho musical bathtub by Duravit is a triple pleasure, one just can’t resist its look, feel and sound. Relax while listening to your favorite music and immerse in fantasies. The Palladio bathtub is made from limestone (just imagine!) “draped” like fabric and falling in soft folds over the edge of the tub. The surface of the bathtub feels so natural and the look is just extraordinary. 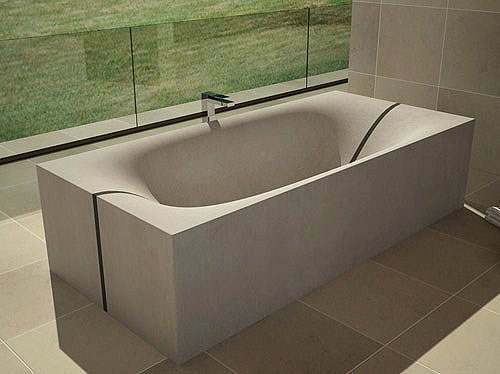 This amazing bathtub is a great solution that can fit into any interior. 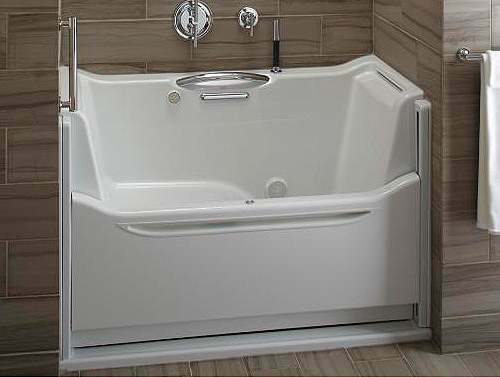 The tub has a special split in the middle, thanks to which it can be easily transported in two halves and mounted together on-site. A perfect harmony of shape, feel and flexibility. 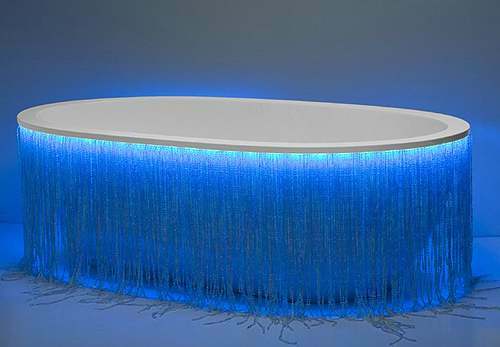 A cosmic bathtub, available in a variety of finishes including red, white, gray, black and even draped in strings of crystals and pearls. Glamorous and chic, incredible in every element. Subliminally, we all strive to nature. 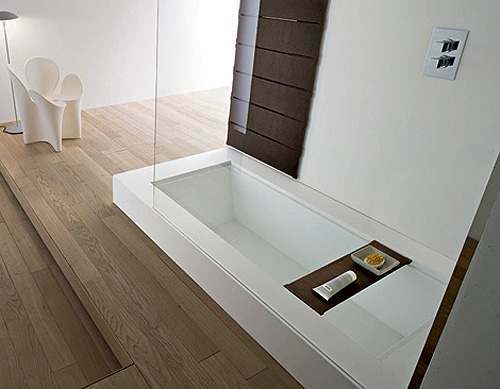 This wood paneling tub by Blu Bleu abandons the traditional “minimalist” aesthetic in favor of the earthy, natural look. The result is quite impressive. 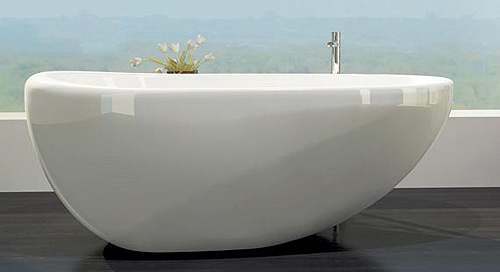 Easy Access Bathtubs by Kohler is another functional miracle created to make your bathing experience more comfortable then ever. The sliding wall lets you enter and exit with ease. Forget climbing in, not to mention the risks of slips and falls! 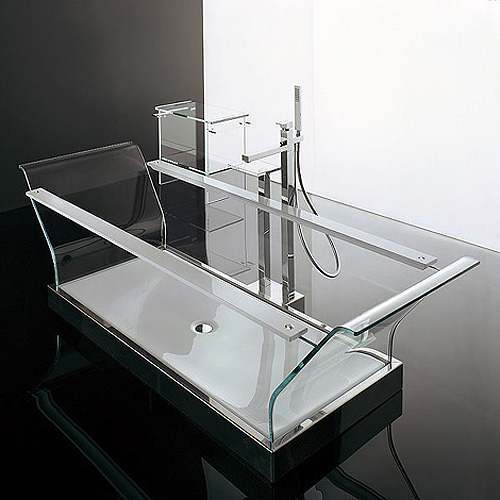 Glassy minimalistic masterpiece from Italian bath brand Glass Idromassaggio. 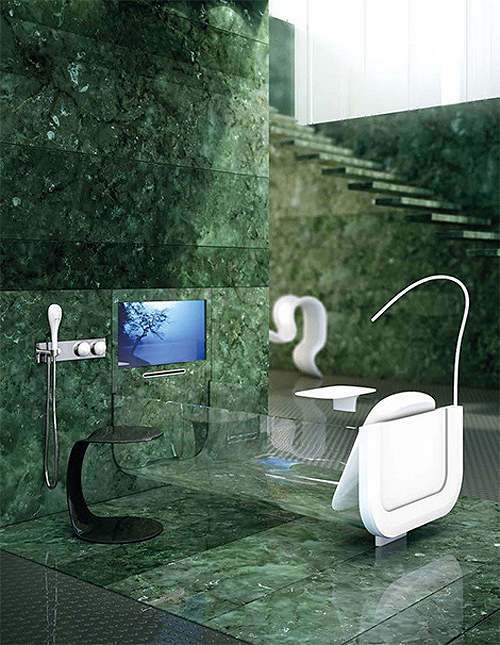 The bathtub has a quick-fill feature, a soft head cushion, integrated light and the built-in television. I’m not sure whether it feels cozy but it definitely gives the feeling of a cool party. 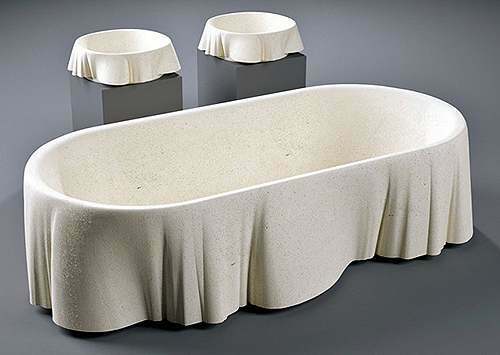 This “something very Paris” bathtub was created by Haute Couture bath design firm Condor. 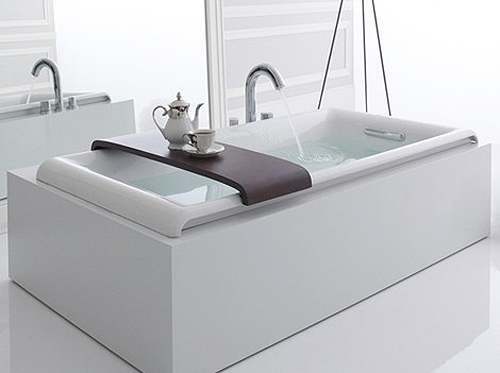 Despite of this very unusual approach to a bathtub concept as it it, this creation is absolutely functional, surprisingly convenient and has lots of features to boast. A sea-inspired marvelous creation made from contemporary organic concrete by Gigi Rossi. It reminds of the waves, seashell, lines of sand and warm wind gently touching your body. The natural colors make the illusion almost real. Black exterior and a clean, white interior. Like a dark chocolate with milk, intriguing, promising and exciting. 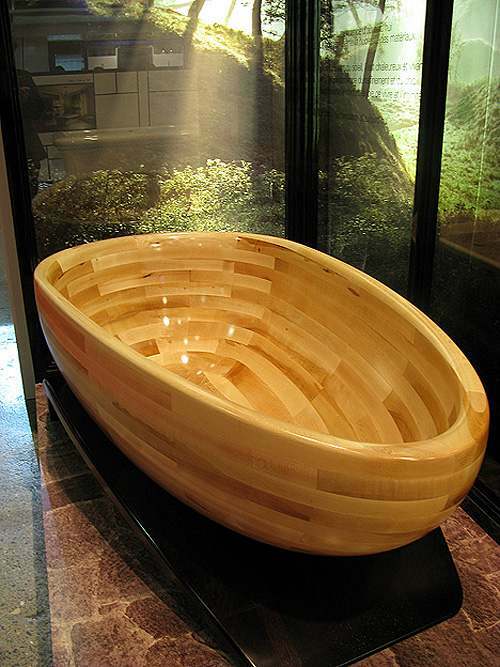 This bathtub was originally constructed out of acrylic, but there’s a limited edition made entirely of wood. There’s nothing more organic that can be, and the natural warmth of wood might be making the bathing experience twice as delightful. 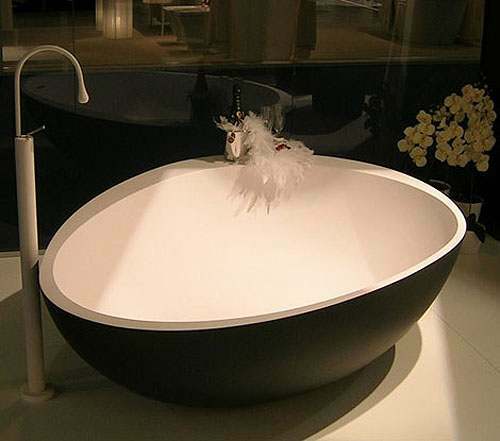 A chic glam bathtub by THG, maybe way too glamorous? Still I love it for its uniqueness and originality. 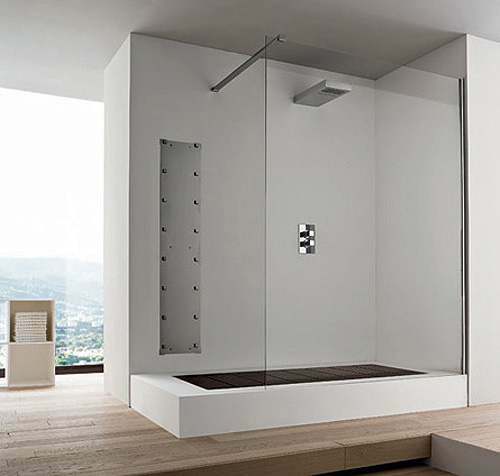 Convertible Shower by Rexa combines the convenience of a shower and the luxury of a bath. This is one of those simple solutions that seem to be so obvious when you see them but have never been really used earlier for some reason. Simply remove the detachable shower floor slats and voila! Relaxing to look at and soak in. This organic egg shaped bathtub design is cradled by an integrated shelf, ideal for storing your potions and lotions, towels, books or bathroom accessories. 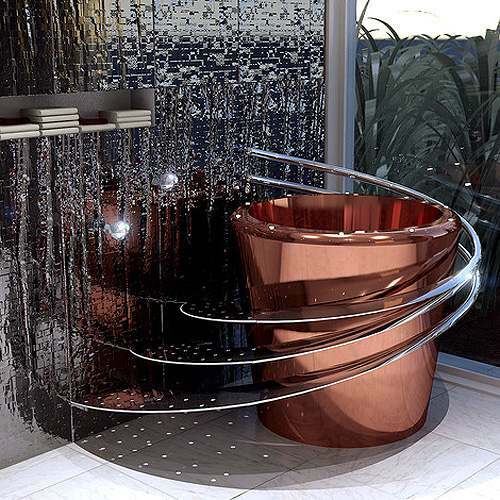 Extremely futuristic bathtub by Wild Terrain Designs that comes in copper or stainless steel. 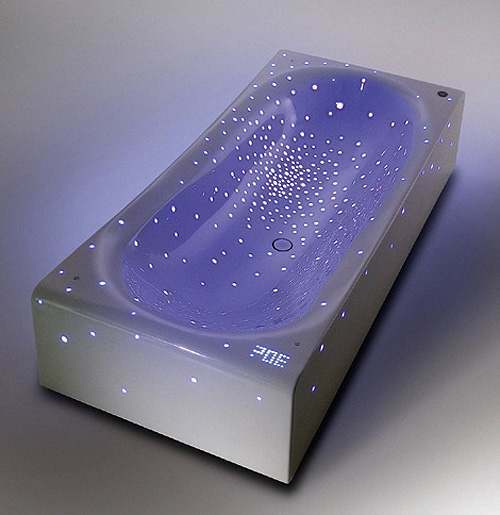 With the LED lights embedded into the outer rim of the tub you are likely to feel like in a spaceship! 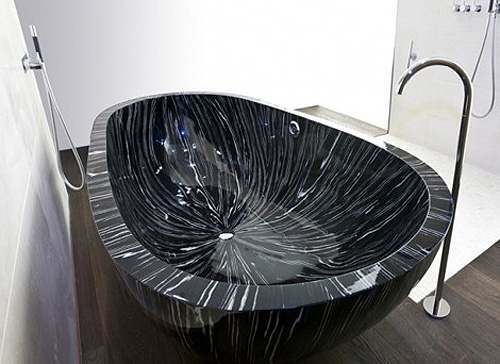 Something that looks not that much of a bathtub but definitely a stunning concept. 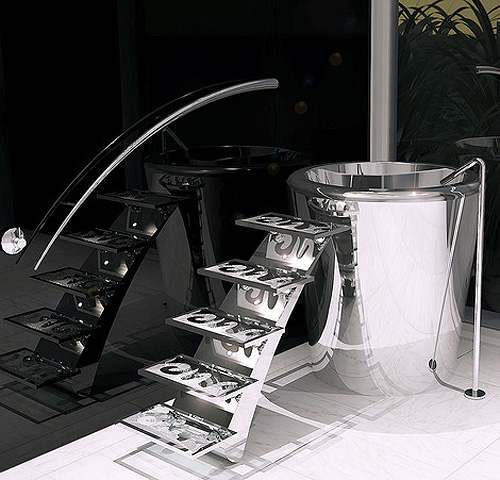 Tub of stainless steel, glass stair steps and faintly glowing LED lights are sure to make you feel very very special. 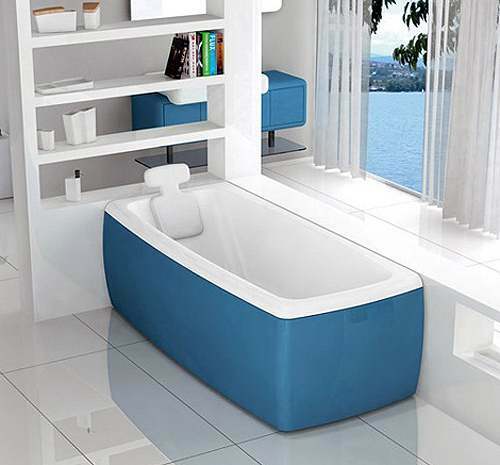 Cool colored bathtubs to make your every day happier! Available in all colors of the rainbow, they are for sure a great mood stimulants! 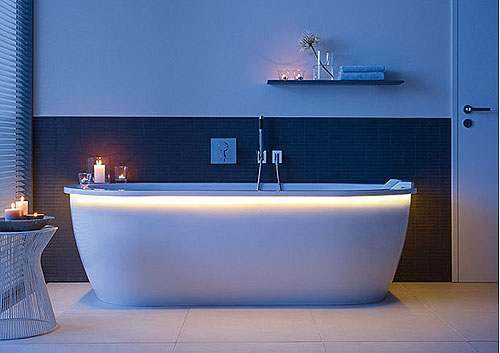 Modern design, 360 LED light spots, high-grade acrylic- the Futuristic LED Bathtub Nirvana is definitely going to be a big surprise. The name speaks for itself, you’ll feel like floating in Nirvana wiggling in the gentle water embrace. Wood Tubs that look nothing like wood! 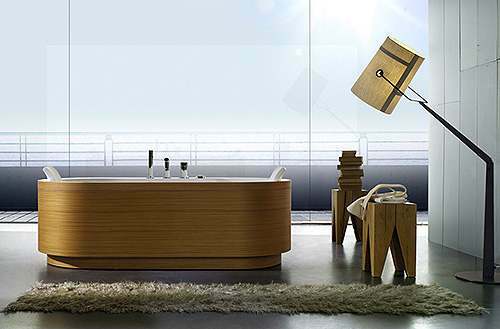 The Sailor wood tubs are some of the newest, freshest items from the Ocean range by Bagno Sasso. 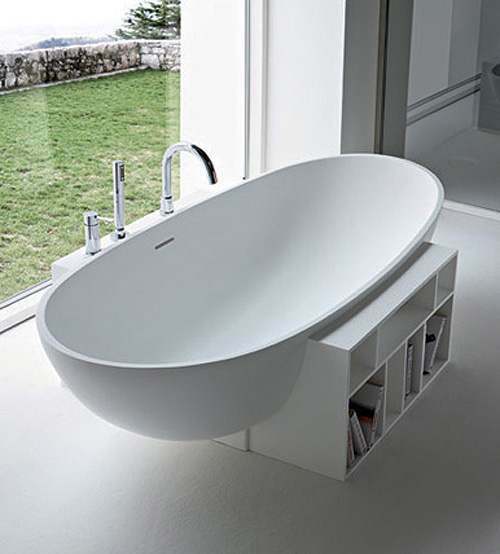 A fabulously creative design, the free-standing tubs look nothing like wood! Rather, the tub is finished with a veneer that looks like marble. Kohler Parity Bathtub has one very convenient and differential feature- a wooden seat accessory that slides over the tub’s rounded lip. You can use it as a pedestal for your morning coffee, as a shelf for some additional toiletry you may need when taking a bath or just a place to put your kids toys when bathing them. This ultra-modern glass bathtub looks incredible but makes me wonder whether I’d feel comfortable taking a bath in it if only I’m not a model with the perfect body. I guess not but still, that’s a genuine concept and I admire its creators.